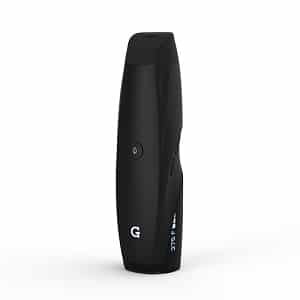 Unlike all my other G Pen units up to this point, the G Pen Elite vaporizer is the first ORIGINAL product to come out of Grenco Science and I have to admit it is better than I was expecting. The first feature I like about the Elite is the LED display with fully adjustable temperature. It’s precise, easy to read and easy to operate. The next feature that stands out is the quick heat up time. We’re talking 20-30 seconds to reach 400 degrees Fahrenheit. The short vapor path definitely creates some warmer vapor and the mouthpiece gets pretty warm as well. But for the size and features, the new G-Pen Elite is very competitive next to models like the CFX, Arizer Air, and the Summit+. The G Pen Elite is currently rated an 8.9/10 due to abundant features at a cheap price. You can pick the G Pen Elite for $119 directly from Grenco Science or VapeWorld. Both places have it for $119 but sometimes they will run sales so be sure to check both out. Check out my full G Pen Elite review below. The Elite fits nicely in the hands, the LED screen is easy to read, and the unit is extremely light. 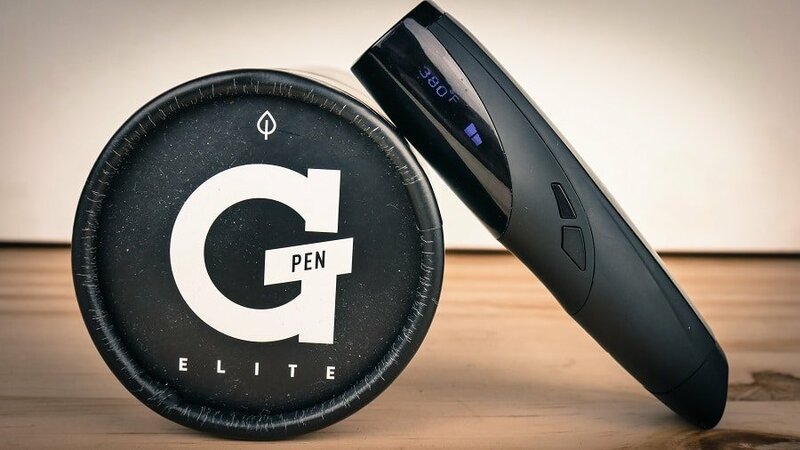 With the G Pen Elite, you also get 1 G Grinder Card, 1 G Pen tool, 1 Cleaning Brush, and 1 USB charging cable. The G Pen Elite comes in at about 88 grams, stands about 4 1/2 inches tall, 1 ½ inches wide and about an inch deep. It’s not a perfect circle which is nice because it adds some grooves to hold on to the unit better. Overall I would say the Elite is one of the smallest portable vaporizers currently on the market, right up there with the the Pax 2, Pax 3, and Davinci IQ. Its small size makes it super easy to pocket or stash in a small purse/handbag. The quick heat up time makes for quick sessions and the unit is designed to not only heat up faster but cool down faster as well to help conserve herbs. I recommend taking a few more draws from the unit after you turn it off to help cool down the unit/herbs even further before you throw it back in your pocket. Now this vape does smell if you leave the herbs in the chamber like other conduction units with good sized bowls, but it’s not bad if you empty the chamber after. Heating – The Elite uses a 360-degree ceramic heating element that is able to provide very quick and even heating throughout the entire chamber. Grenco Science claims that the unit is convection but it’s most definitely conduction with a minor amount of convection going on. The entire ceramic chamber is heated so it will be heating the herbs from all sides while the herb is in constant contact with the heat. Now this isn’t a terrible thing, but the vapor quality does suffer from it. Temperature Info – The Elite uses a full temp spectrum and can easily be changed/adjusted with an on vape LED display and two buttons just to the right of the screen. -The buttons work nicely and don’t feel cheap. -The LED display is very sharp with no blemishes or pixel issues. The full temp spectrum runs from 200 degrees Fahrenheit to 428F (93C – 220C) I believe they are also coming out with a model similar to the Elite but made exclusively for concentrates. So be on the lookout for that and I will try to get my hands on one as soon as possible. The unit seems to run a little hot especially with the short vapor path, so my preferred temps are around 350-375 and then bump it up a bit more towards the end of the session. Vapor Path – The vapor path is extremely short on the Elite and that’s really the biggest downfall to the unit. That and the fact that the Elite will need a couple rounds of burn-offs* to get rid of the new vape manufacturer taste/smell. That’s the big thing I like about units like the Pax, IQ, or the Crafty/Mighty. You never have to do burn offs with these units to get a fully clean/neutral taste before use. While this is a bit of a pain, it’s not the end of the world and the smell/taste associated with the manufacturing process will go away quick. *Burn-offs: Heating the unit up while empty, and puffing on it like a cigar so you are drawing air through the unit but not inhaling it. Chamber Size – So the G Pen Elite chamber is large. We’re talking up to .4 grams can be loaded into the Elite with an average grind and I was able to get about .5 grams in with the MFLB Finishing Grinder. You definitely don’t need to put that much in the chamber for every session and I’ve found that the Elite does surprisingly well with varying load sizes. You can load as little as .1 grams and still get a good even vape of your herbs without having to stir or mix. How-To Use: The G-Pen Elite – Overall pretty simple, just click the power button 5 times to turn it on (5 times again to turn it off). Once the unit is powered on, it will show you the default temp that you have it set to. The Elite will remember your last setting. The unit does NOT automatically begin heating on power up so just hold down the power button for a second to start the heater. You can change temps on the fly by pressing the two buttons (up or down) to the right of the display. The Elite does have an Auto-Shutoff timer which will automatically shut the unit off after 40 seconds if you don’t turn the heater on and the unit will completely shut off after 5 minutes from the initial heating start. Just press the power button 5 times to turn it back on if the unit shuts off on you. Loading Techniques – After quite a bit of testing, the G pen Elite seems to work pretty well with all sorts of packing techniques and dry herb types. My preferred method would be to use the MFLB Finishing Grinder, load the chamber fairly full and pack it down a bit. Rip the entire thing while watching the new season of Trailer Park Boys and if you prefer to use smaller amounts you can. You can also turn the unit off mid-session and finish the bowl later. But like other conduction units it is more efficient and tastes better when you finish the session in one setting. The vapor quality definitely diminishes as the herb cools down/sits in the chamber. The Elite is a bit cumbersome to load on the go but just lightly tapping on the side gets the herb to drop down into the chamber. Packing down isn’t needed but you will get a bit denser vapor with a light to medium pack. So far I’m pretty impressed with the battery life, especially for the size. I can generally get between 3-6 fully packed chambers depending on what temps I use and how long I nurse the bowl. The Elite is charged via USB, the batteries are NOT replaceable, and on average the G Pen Elite takes about 2-3 hours to fully charge a completely dead battery. This also depends on where you charge it (Use a 2amp charging block or external battery for fastest charging). Cleaning – The cleaning with the Elite has been pretty simple with the screen in the mouthpiece taking the most time/attention. So far it hasn’t been an issue and the good news is that the silicone cover over the mouthpiece is removable. You can just drop the mouthpiece in some ISO for a while then rinse it out with some warm water. I will continue to test out the mouthpiece screen and report back if I have any issues, but so far so good. I know that Grenco Science isn’t exactly known for the quality in their (rebranded) products. I have the other Grenco Dry herb products like the G Pro (which is actually a titan-1) and I didn’t care for any of them. Due to this I was really not expecting much from the Elite, but I’m impressed. It is nice they have FINALLY created a unique portable vaporizer that I can recommend. 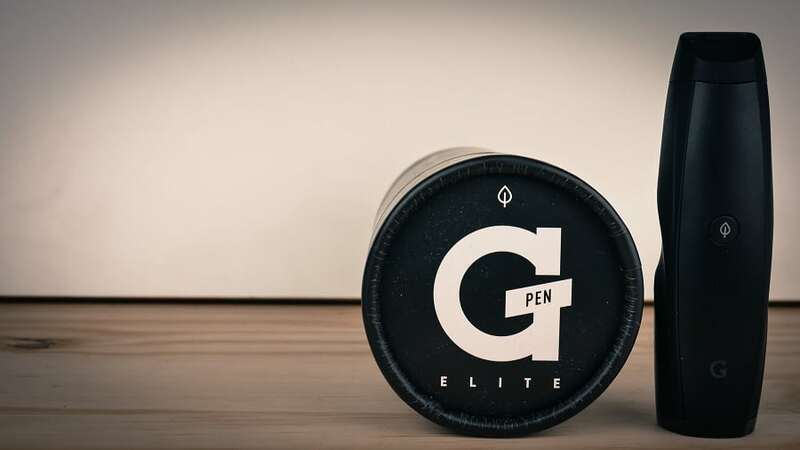 The G Pen Elite comes with a one-year manufacturer warranty which is below market average but nothing so far has indicated it won’t stay reliable. The $119 price of the Elite puts it in a competitive market. The big thing that the Elite has above most of the portables in this price range is the on vape LED display and full temp spectrum. Most of the other vapes have a few set heat settings to change from but you don’t have complete control. G pen Elite vs Pax 2 vaporizer – The Elite is smaller, lighter, and has more features. You will only get 4 temperatures, no LED display, and longer heat up with the Pax 2. You will have to clean the Elite less often, and it takes less time to clean. The Pax 2 is also priced a bit higher at $149. However, the Pax 2 is one of the most durable and reliable portable vaporizers that I’ve ever used. It has a proven track record and backed by a 10 year warranty. The vapor quality is also much better with the Pax 2. So even though the Pax 2 is $30 more, I think it’s definitely worth it. Elite vs Boundless CF – The CF is larger than the Elite, and you lose the fully adjustable temperature control and you also lose the digital display, however you gain better tasting vapor that is both cooler and more dense/potent. You also gain slightly faster heatup time, and longer overall battery life. You also save about 10 bucks going with the CF. Elite vs Xmax Starry – I like using the Pax 2 and the CF more than the Starry, but the Starry comes in at only 99 bucks and its feature packed. You get fully adjustable temps, you get replaceable batteries, and you get the digital display. So if you are looking maximum features at minimum price you will probably want the Starry. Overall the G Pen Elite has surprised me with some solid features and extremely portable design. Full temp spectrum and LED display is really impressive for the size and price of this device. I was very skeptical at first. Even emailed the company multiple times to guarantee that this was an original design since they has previously been known for re-branding generic units as their own. I recommend the G Pen Elite if you are looking for a solid vape but don’t want to break the bank, however the Pax, CF, and Starry are all worth considering as well. Right now you can pick up the G PEN Elite for $119 and I recommend going directly through Grenco Science or Vapeworld. Thanks for checking out my G Pen Elite review and let me know if you have any questions below in the comments. Awesome features and small size make the G Pen Elite a great portable vaporizer to add to your collection. Not the best vapor quality but super fast heat up time and a full temp spectrum make it worthwhile. Good to see they have made stepped away from their previous rebranded models. I had the displeasure of trying the old gpro dry herb pens. Aweful by any standards! Glad to hear this new Elite model is a departure from their previous dry herb pens. Always good to see more competition and viable options. Thanks for the review Buzz! My pleasure Carlos! I agree, more competition is better for us all especially in the under $200 price category. When this came out in 2016 it was actually better than a lot on the market and at a cheaper price, however nowadays you can get better units for better prices. I recommend people look at the Xmax Starry, the Boundless CF, and the HealthyRips Fury 2 over the Elite. It’s on sale for $60 today. Is it worth it?? What is your take on G Pen Elite vs. Pax 2? Limited focus of price points, just want to get the best product. The Pax 2 produces better tasting and cooler vapor, the battery lasts longer, and the warranty is much longer. However the G Pen Elite heats up quicker, and has fully adjustable temperature versus four choices with the Pax 2. While I do prefer the Pax 2, the $100 price bump is pretty large. Have any thoughts on how this performs compared to Boundless CF or CFX? The first difference between these devices is going to be size, you CF is the same height as the elite, but you can fit 3 elites in the width of the CF. With the CFX you add another half inch of height and its as wide as 3.5 elites. Beyond the large size difference they all have ceramic conduction bowls with very similar capacity, they all heat up faster than the average conduction vapes. I would definitely go for the Elite if you value portability, and if you want the longest battery life the CFX wins. does it get really hot in the upper part because of the chambers position ? You are right, since the oven is at the top, that makes the top of the unit and the vapor temp hotter. Vapes that have the bowl on top generally have this issue, and vapes that put the bowl at the bottom like the Pax 2 have cooler and smoother vapor, but a bit of extra cleaning since you have to clean a vapor path that goes from the top of the mouthpiece to the bottom of the unit. 8.9 is a pretty good score on my chart. I have also come across some reviews didn’t seem to do much of a test/review on the elite, they sort of just regurgitated the marketing material. I tested mine heavily before releasing my review. As far as the Pax 2 vs G Pen Elite goes, I do prefer the Pax 2 for a few reasons such as tastier and cooler/smoother vapor along 10 year warranty, but I also prefer the G Pen Elite for a few reasons such as faster heat-up, fully adjustable temp settings and cheaper price. My biggest cons for the Elite are average vapor quality, and hot vapor path and hot mouthpiece with prolonged use. what would you recommend the g elite or the vapium summit? I have read several reviews on both and can’t decide on which one i want. I’m looking for a decent battery life, and vapor that wont burn or anything like that. I am new at this so its hard to know what to look for. I would definitely have to go with the G Pen elite for the faster heat up and full temp spectrum. I’ve also found that I need to stir the summit chamber for the best results and I don’t have to do that with the G Pen Elite. Hi Buzz, thanks for all of the great reviews. I just bought a new Elite. Wondering what you mean by “burnoff process” for breaking in a new unit? Do you have to load the chamber with material and burn it out? Or do you mean burning out the chamber while empty? Completely empty, on max temp, draw from the mouthpiece but just immediately blow it out. I usually do that for a full battery, sometimes more before I throw any herb in. I also like to clean it out with some ISO first, and then again about half way through. Let me know if you have any questions. What is ISO? Isopropyl alcohol? Yes you are correct, and try to find the highest percentage you can. Locally I can find 70% and 91% easily so I always go with 91%. i prefer the pax 1 even over the 2 because ill always be able to replace the battery with a panasonic 18650 3400 mah. beats the original pax one 2700 because the 10 year warranty doesnt cover batteries; i was told itd cost 200 bucks. so i bought a used 80 dollar pax (authenticated ofc) which held very little charge, had been handled by someone who didnt understand lithium ions’ needs (hates going from 100-0, 80-20 is the sweet spot which is why the pax turns green when it hits 80 percent ;). youll burn your l.ion out way quicker using it improperly and this one was weak but what can i say for 70 bucks, him admitting the battery wasnt perfect, and an authorized dealer recipt and box. note the two magnets holding the bowl falling out! so now i have a pax with the battery life of a 2 for 92 dollars and a small amount of labor. as far as i know, no one has been able to open a pax 2, they literally had to mill it open from each side oO, so unless you have their special tool, you arent getting in. Hi buzz, i dont realy understand what “vape quality” is, i just got my hands on the g pen elite, i dont get as much vape AMOUNT as in the video, does it mean that if i dont have much vape coming out then i feel the effect less? And mabey a silly quastion, but how do i know that the session is over? Vapor quality is quite a catch all term, to me it mainly encompasses vapor flavor, vapor temperature, vapor density, and how smooth the vapor is. The Elite doesn’t do the best in the vapor temperature category since its a very small unit with a very small vapor path. As far as getting a larger volume of vapor, the best way for a conduction vape (which is what the Elite is) you will want to grind very finely, pack the oven full, and even tamp it down a bit. Then you will want to take a longer slower draw than you expect, more like a sip. When the session is over is up to you, I personally start the Elite around 350f or 360f usually, and then when the vapor gets a bit thinner I bump it up to around 380f and then once the vapor gets a bit thinner I am generally done, however you can bring it all the way up to max temp and wait until the vapor goes away if you want to extract everything. If you do go to max temp, expert the vapor to taste worse and be harsher near the end. Great informative video as always. I believe you stated the arizer air is slightly better than the elite, but I have to personally ask you since I’m buying one tomorrow. I don’t really care about size, oversized chamber, and quick heat up time. Rather, I look for an efficient and better tasting device. Considering that, which would better accommodate me? Hey! Thanks for the great reviews, super helpful! I am looking for a vape for my boyfriend and I. I am a vape lover and he really struggles to get good vapor quality. We used to have a pax and a mflb and he really struggled with both We have been looking at the crafty because it seems to be rated as getting the most consistent vapor for people who struggle with vape technique. How do you feel about the gpen as far as consistent vape quality and the need for strong vape technique? Would love to avoid the high price tag on the crafty, but wanna make sure we get one that works for him. Thanks! Hey Carly! Thanks for the kind words and taking the time to check out my site. I think the G Pen Elite is much more consistent than both the MFLB and the Pax. The original Pax has quite a bit of draw resistance and requires above average cleaning at this point to maintain. Where will you be using the vaporizer most? Do you need it to be portable? Based on what you’ve said I think the Elite will be a good match for you guys but I would also check out the CFX and the Arizer Air. I would go with the CFX if you needed the best battery life, I would go with the Arizer Air for best vapor quality and if you didn’t need absolute portability. I would go with the Elite if you needed the most portable unit with quickest heat up for fast sessions. Both the CFX and the G Pen Elite heat up in under 30 seconds. The Air takes over 60 seconds but offers the best vapor taste, smoothness, and coolness. The CFX and G Pen Elite will push out HUGE clouds but won’t be as pure tasting as the Arizer Air. The CFX and the Elite will be the easiest to use both offering a full temp spectrum and large chambers great for group sessions. I’m almost done with my CFX review, it will be up today (7/18/16). For now, here is some more info on the CFX and AIR from my recommended authorized store. I have been searching for a vape for a while now and I have been struggling in choosing one. I’m in college, work part-time and participate in sports, so I don’t have the time to smoke regularly, I would be lucky if I get to smoke once a month but once I do get the chance to smoke, I’m not prepared. My cannabis store recommends the G Pen Elite but I want a second opinion. I tend to smoke a large amount every time I do smoke 0.5g – 1g, so I do believe this is perfect for me. The Elite is a great first vaporizer. Easy to use, heats up quick, large chamber and easy to pocket. You could also check out the CFX but it’s bigger and harder to pocket. I think the vapor quality is better with the CFX though and you still get a full temp spectrum, LED display and on vape temp buttons. Two year warranty on the CFX as well. Both are good. Hey Buzz, from doing some sleuthing on the interweb, it looks like Grenco has released the newer versions of the Elite with an updated mouthpiece with baffles to help elongate and cool the vapor path. Did you try the original version with the straight through mouthpiece or the updated one for your review? I have both, but I did not complete my review until after fully testing the new/baffled mouthpiece. Sorry about that dude. I wouldn’t buy any G Pen products other than the G Pen Elite. I think I even say that in my review. It’s not my product either, I’m just a reviewer. I would check out the vapcap or the flowermate vaporizer lineup. i was wondering if you have tried out the the Astral made by the company Vapeur. I am looking to buy my first vape for dry herb and was considering either it, the G pen elite or something similar. not ready to spend more on a pax2 or ff2. Hey man I think I just answered your email. I recommended either the CF ($129) or CFX ($169). Check out my CFX review on youtube to see the two compared a little more. I have a CF article coming out shortly and video shortly after that. Hi, how does this compare with the V2 pro 3 in 1, thanks in advance. If you are looking to vape dry herbs I definitely prefer the G Pen Elite over the V2 Pro series 3 and series 7. The Elite is more portable, it has a full temp spectrum, and the vapor quality is better. the V2 has the option for wax right? the Elite does not? Correct, the V2 has a wax cart, whereas the Elite doesn’t have a way to vape wax on its own. With the elite you need to sandwich the wax in-between dry herbs. Hi Buzz! can you compare Elite, Flowermate V5.0 pro, x max v2, cfx? 3-5 step temp controller is enough or really should go to lcd like in CFX or Elite? I smoke 1-2-3 times a week, mostly at home. don’t want to buy something in entry level and then upgrade it in a year. want to buy some good stuff that will stay with me for couple years and in the same way I don’t have enough $ to buy pax 2 or smth like that. Check out the Arizer Air ($169 w/ Code: AIR). I think the Air will have the best taste and experience. It’s easy to pick up a WPA (water pipe adapter) so you can use it at home with glass as well. I really like the CFX BUT it’s bigger, has more draw resistance and doesn’t produce as good of vapor quality. The Air is also extremely durable and reliable. The CFX and G Pen Elite are still new devices without a proven track record. Kief would be ok. I don’t know anything about hash man sorry. How do you like the G Pen Elite compared to the Firewood 4? I do not have the Firewood V4 yet, however I do have the Firewood V3. The Firewood V3 has better flavor, and better overall vapor quality, but it takes much more practice/technique to get good draws from, and it’s also possible to combust so it’s definitely more of a connoisseur/enthusiast unit for someone willing to learn the intricacies and technique to get good results. Thanks for that ultra quick reply! May be a strange question but, how noticeable is the scent of the Vape in the air. I will occasionally stealth a few indoor hits and am interested in knowing how “Defined” the smell of the herb is in the Vape? As far as portable vapes go, this one is average to above average for smell level since it is a full conduction unit, and it has a larger than average oven size. Compared to combusting it smells much less and dissipated much quicker. A lot of the smell has to do with the smell level of your specific dry herbs as well. Hey, how long does it take you to smoke a full chamber? Depends on how much load. The chamber can hold upwards of .5 grams with a fine grind and tight pack. It does work well with varying load sizes so you don’t have to load that much. I would say a typical session with the G-Pen Elite will run around 10 minutes or so. Once again it completely depends on how much herb you load. I’m convinced, great review! I’ve been through tons of reviews but i could never really decide between the G Pen Elite VS the Pax 2 gotta. Thanks for sorting me out man, one of the best out there, be it medical Jane, Gizmodo or otherwise! Thanks Ken! I’m glad I could help you out! Enjoy man! I don’t smoke often and when I do I use a very minimal amount of herb. That being said, donyou think the elite would be a good choice? The Elite does work alright for small loads, you will want a fine grind, and then pack a thin layer on the bottom then press it down so that it stays in place. If you can spend a little bit more the Grasshopper at $200 would be my first choice for micro-dosing. Also, great reviews! I’ve seen almost all of them. You can tell who takes their job seriously and who’s just messing around with a camera. Thanks for your honesty on the reviews. Thank you, I really appreciate the kind words. Hello Buzz! Thanks for the nice and useful reviews! I´m from Japan and I read your reviews very often. I was going to buy some normal g-pen as a first vape, but thanks to your reviews I have chosen the G-Pen. I have been with this vaporizer some time ago since the release. I´m ready to upgrade my vape to a high end one. I´m between the Firefly 2, the mighty and the pax 2. I only smoke at the end of the day after work and I also do a lot of sports, which of them do you recommend is healthier and also harmless to the sport performance? thanks for the reply and the good reviews! You will definitely enjoy both but they both function very differently. The Pax 2 is a session vaporizer (conduction) which means the heat is always vaping the herbs regardless if you’re drawing or not. The Firefly 2 is an on-demand convection vaporizer which means the herbs are only being heated when you are drawing. So if you like to take a couple puffs and put it away, I would go with the firefly 2 and if you like to sit and chill for 5-10 minutes then I would go with the Pax 2. I consider the Firefly 2 more like a pipe, one-hitter, etc… whereas the Pax 2 is more like a blunt or joint. I do prefer the vapor quality of the Firefly 2 over the Pax 2 and the Firefly 2 is also much easier to clean BUT it’s much easier to get consistent results with the Pax 2. The Firefly take a few sessions to get the hang of it but once you do, you will absolutely LOVE the flavor and vapor production from the Firefly 2. They also just updated their app and it’s a lot more user friendly. Let me know if you have any more questions about the two and I can try to break it down a little more. Thanks for checking out my site! Have you had any or know of any issues with the plastic on the main unit the attaches the mouth piece breaking or cracking after a couple months of regular use? I am on my 3rd unit and keep having this issue. I’ve purchased additional mouth pieces and use a clean one most every day. The latest replacement by Grenco lasted less than 2 months. I think I had issues with the first most piece but the second was fine. I don’t really use it all that much anymore. What are you cleaning it with? Only use soap and water on the plastic pieces. ISO on the screen. Hey Buzz, I came across your review after doing research for my uncle. He is wanting a Vape that is very portable, and very little aroma, that way he can vape in public. Would the G Pen Elite be a good choice for him? If not, could you recommend something better? Thank you for your time. I prefer the Xmax Starry or the Davinci Miqro over the Elite. The Miqro is definitely my favorite in this price range right now. Good flavor, easy to use and conceal plus it uses replaceable batteries.